I admit it, the Otters have been my white whale for the last couple years. I kept trying to fit them into a baseball trip, but they never quite meshed. Evansville is a nice town on the southern end of Indiana and you have to want to travel there to get there. I did and I did. 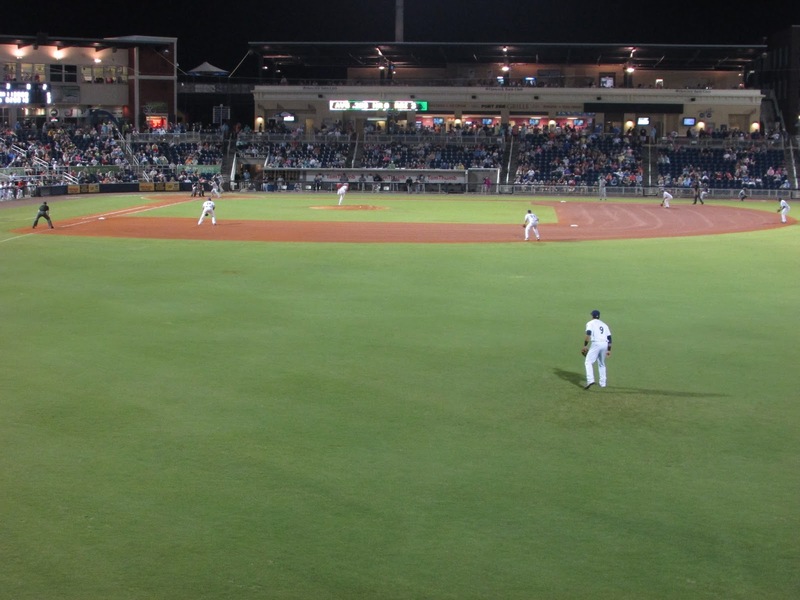 The Evansville Otters are the last remaining founding team in the Frontier League. It's housed in Bosse Field which they are very proud of. This field is more aesthetically pleasing than most fields I've been to over the last couple years. Instead of the miles and miles of concrete which surrounds most stadiums, Bosse has these strange things called "grass" and "trees" around the park. There's actually shade outside the park as you wait to go in. It's a bloomin' miracle. Once you get inside, the park is filled with old-timey ads which are actually a legacy of when "A Field of Their Own" filmed there. They have female employees wearing the uniforms that were worn in the movie and the usher who meets you as you walk in is wearing an old-school white usher uniform complete with milkman style hat. 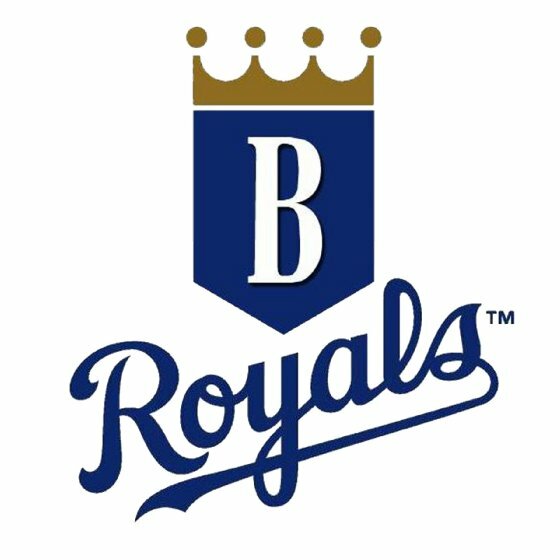 The people working the stadium were extremely friendly and if you buy the reserved seats behind home plate they will bring your food to you. The layout of the stadium is a big circle which on the one hand seemed old fashioned, but on the other hand seemed a much better design than I've seen at a lot of modern parks. Everyone had seats they could see from and shade too (it was a midday game). Behind the plate they had replaced some of the closer seat with plastic ones, but a large part of the stadium had old wooden seats and I mean old wooden seats, not faux old wooden seats. They were obviously cannibalizing some of the seats at the far ends of the stadium to keep the rest in good shape. Still, the vast majority of the seats were in good shape. The day I was there I think about a thousand people were in the stadium and it had room to seat a lot more comfortably. Sure, the stadium could use a little cash influx to fix some stuff, but that just means it's a really nice stadium instead of an awesome. 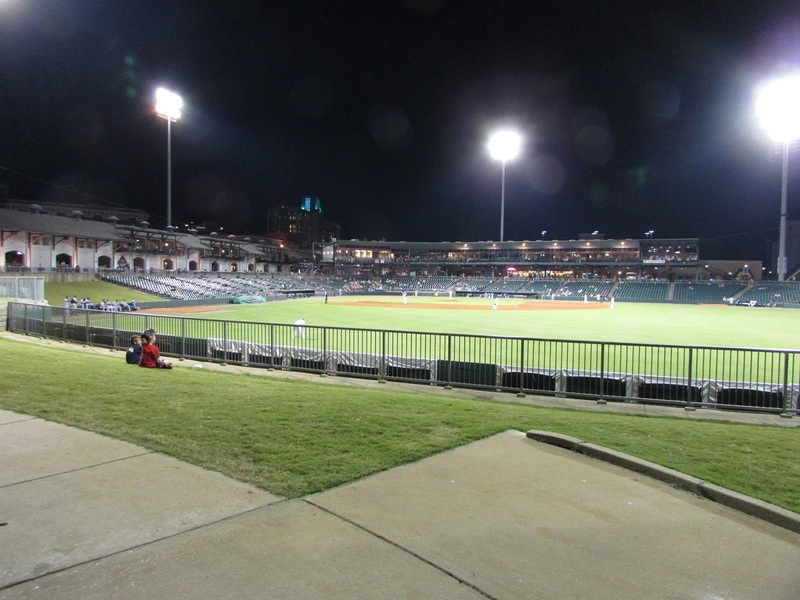 Heck, if I had the money, I'd buy the AA Mobile Bay Bears, rename it Otters, and move it to this stadium. 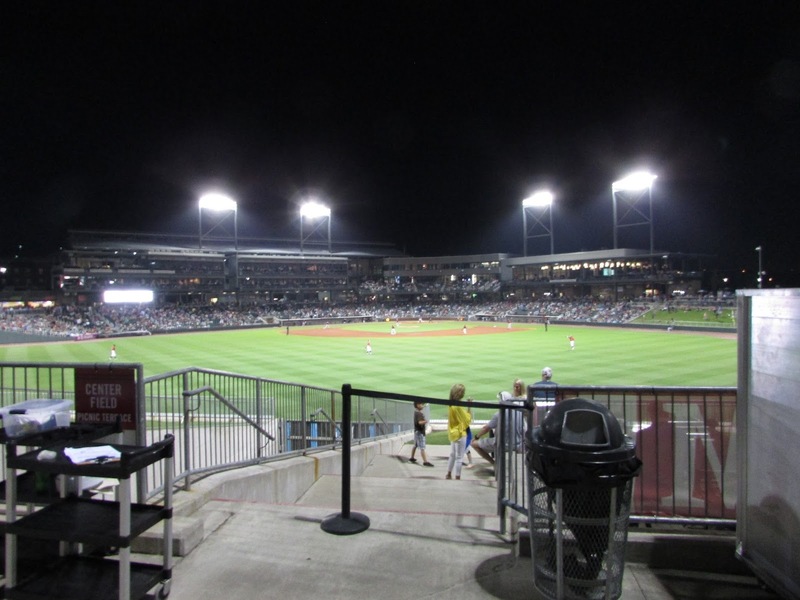 As it stands, without a single luxury box, Bosse's a better stadium than the one in Mobile. The number of A and A+ stadiums it's better than must be fairly large. Asheville and Potomac come to mind without much thought so I'm sure there any number of others. 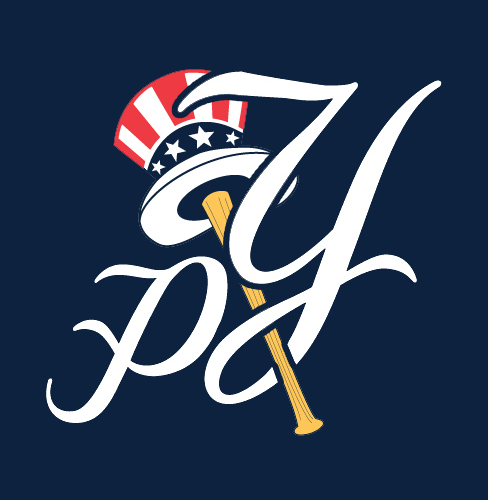 If MLB ever gets off its duff and expands it needs to snap up this place as somebody's affiliate. I always enjoy Frontier League games because it feels more like they are playing for something as a team rather than as individuals trying to make their statistics impressive enough to get moved up to the next level. It's not entirely true, of course. 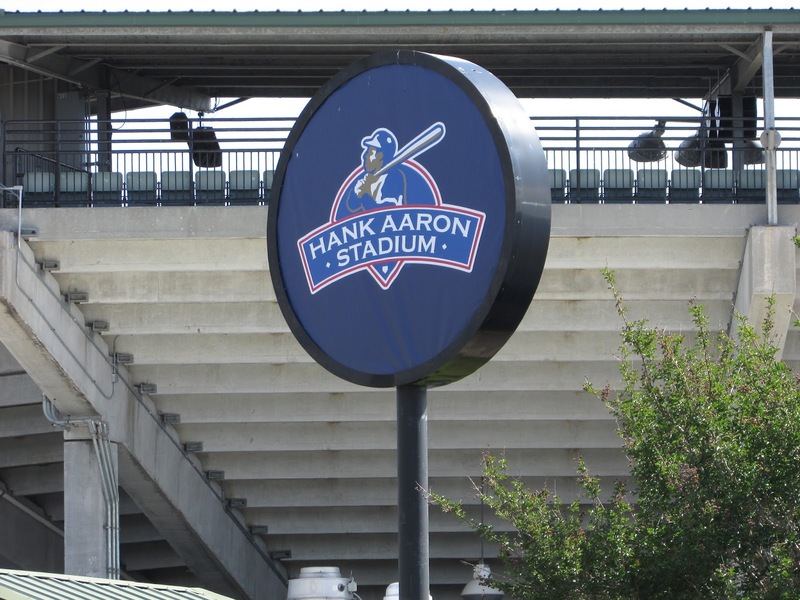 The Frontier League is acting as an unaffiliated, unpaid-for, rookie/single A league for MLB. 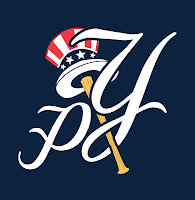 Still, while affiliated baseball occasionally buys out a contract that's not happening for the large majority of them and you feel like you're watching guys who are there because they want to play ball and they are having fun doing so (it sure as heck can't be for the pay). The Otters are the best unaffiliated minor league experience I've had to date. 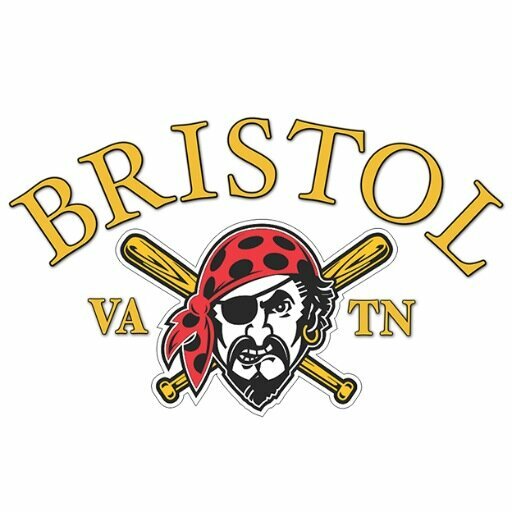 The Appalachian League starts up this Friday and I've combed through the goodies list to see when you should go to have a unique experience and/or get swag. The list doesn't include all the days that each and every park seems to clone like military appreciation days or Christmases in July or cheapie food nights. The most likely to draw me have been highlighted in yellow. I've also included a grade for each team beside the team's name which is completely subjective and colored by which of these events which actually draw me to the park. However, you must understand that this is not a comment upon which teams I think are most worth going to see. If this year tracks like previous ones, I will go to see more games at Kingsport, Bristol, and Elizabethton - at least two of which got poor grades. was the most unique and fun event I saw in the 50 games I went to. 21 August - Golf Night? The Fireflies were the Savanah Sand Gnats prior to this year. When Savanah didn't give in to the "build us a new stadium or we'll move" blackmail, the owner moved them.They got a shiny, nice new stadium in Columbia South Carolina (where the insane asylum used to be with a weird mudpit in front of it). Savanah got to keep its integrity. 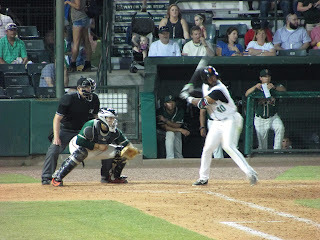 I got to make a trip to Columbia to watch the Fireflies' first rain shortened game. 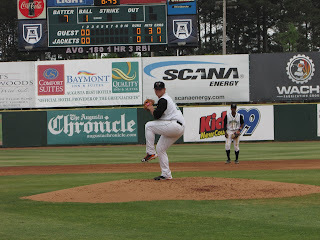 The Fireflies were playing the Kannapolis Intimidators, which certainly made for a colorful on field presence. 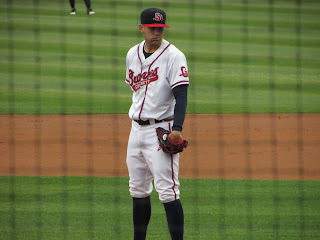 Kannapolis wore a bright red uniform while Columbia wore an almost neon yellow. I admit it, I bought a Columbia jersey. I bought it for two reasons. First, in an era of gawdawfulstupid team names choosing a decent mascot should be rewarded. Second, if I ever have to walk down a dark road at night I won't need an emergency vest. I'll just throw on the Fireflies jersey. The stadium had a nice edifice on the outside and inside it was a basic single level stadium that was shiny and new, but didn't have much that distinguished it from any other stadium. Of course, it had an upper level with the ubiquitous luxury boxes which every team demands be built into their stadium anymore. There was a fairly decent size crowd, although the stadium was not anywhere near being in danger of a sellout. The crowd seemed pleasant enough, but they seemed kind of reserved and I think maybe they were still getting used to the concept of having a minor league team in their midst. before the Fireflies even got a single man out. 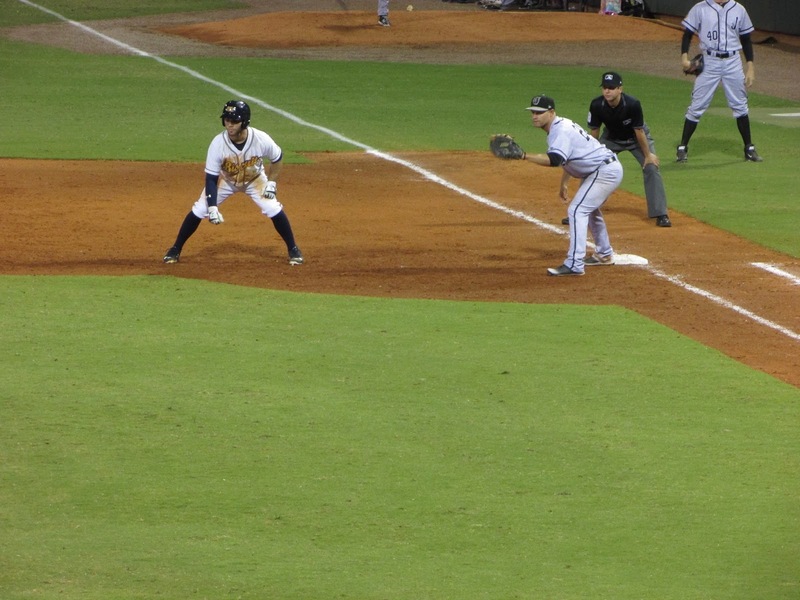 In the bottom of the same inning, the Fireflies got a run with a single, error, and sacrifice. 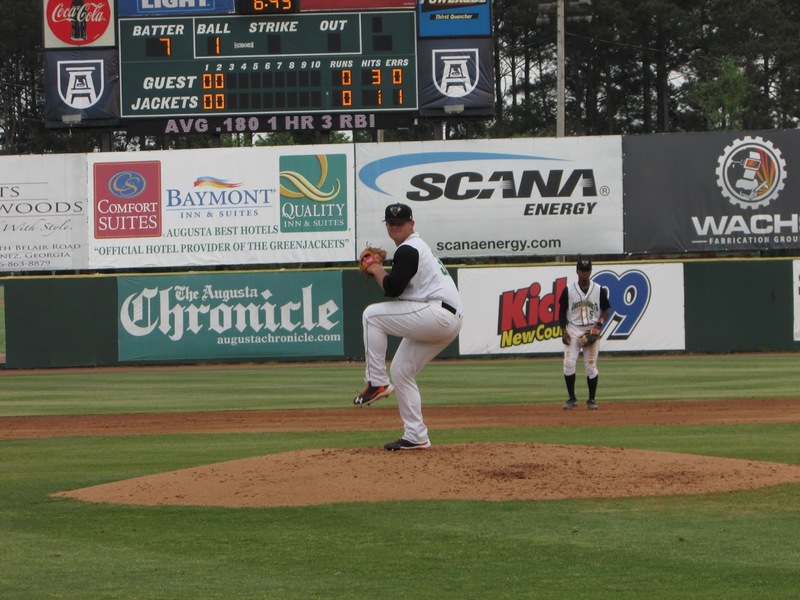 In the seventh the Fireflies shaved another run off on the strength of a double and two errors by the Intimidators. So, with one of the most interesting games I've watched this year still in question, what happens? Yep, sheets of rain. The video doesn't do it justice and misses the lightning as well. They waited a while, obviously hoping to get the game started again, but when the water started forming small lakes on the field they gave up and called it. 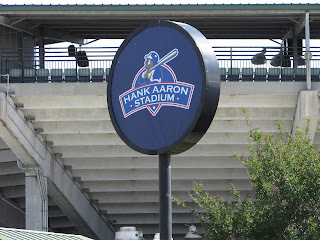 All-in-all, a decent stadium, a laudable choice in team name and logo, and an enjoyable experience. Go watch the Fireflies glow (in broad daylight) if you are in the Columbia area. 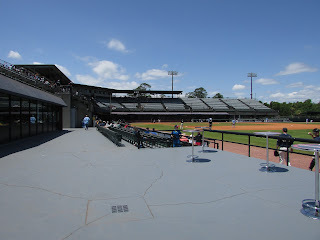 Augusta has an old stadium. That's not to say it is a bad stadium. In fact, in an era of soulless new stadiums which all look and feel exactly the same Augusta's stadium feels kinda retro-chic. 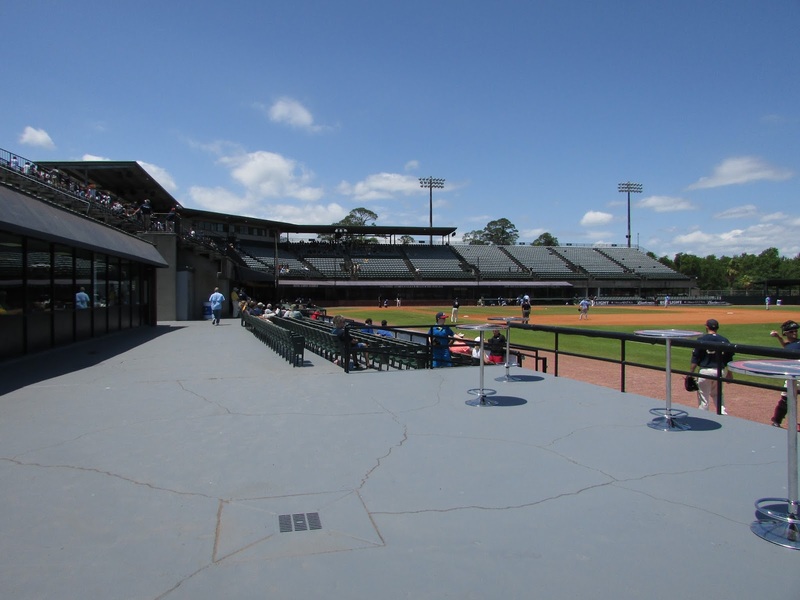 So, of course, the Augusta GreenJackets are trying to build themselves a soulless new stadium. It's a shame because Augusta really doesn't need a new stadium like some places (I'm looking at you Potomac), but of course, it has to jump over that cliff just like all the other lemmings. The staff was friendly, the mascot was a yellow jacket wearing a green jacket, and the crowd was having a lot of fun.If you don't understand the "green jacket" reference (I kid you not, one guy actually said to me "But there aren't any greenjackets. "), go find a buddy who is into golf and ask him. The only flaw I found in the entire place was the souvenir shop. It was rather anemic and if you're looking for something other than hats you may be a little disappointed. 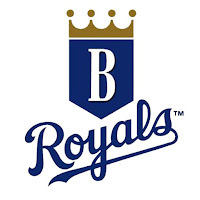 Specifically, I collect both pennants and baseballs with the team logo. 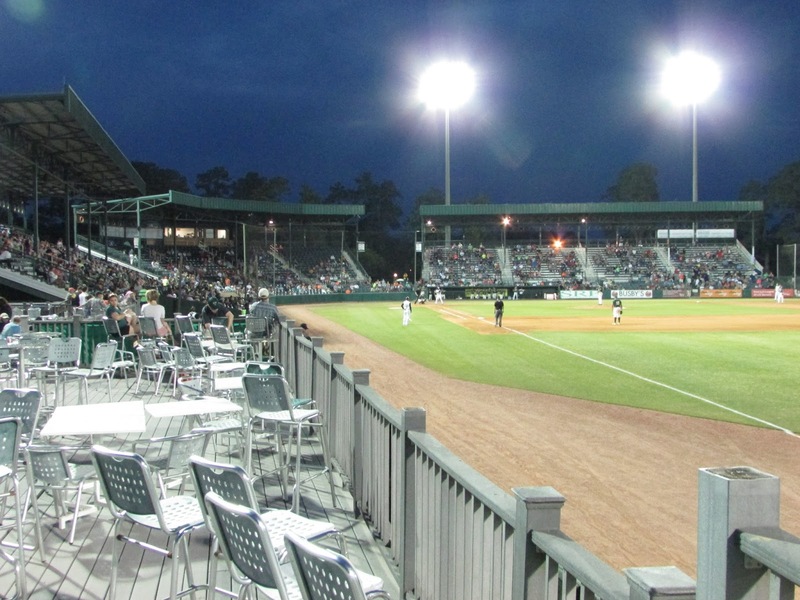 Both are common staples of souvenir shops and the Augusta GreenJackets shop had neither. They had miniature footballs with the team's logo and league baseballs, but no team logo baseballs. They had a pennant on display, but none for sale (it was a pennant they give away for free every so often). The lady working in the shop was as helpful as she could be. She told me the next time the pennant would be given away and pointed me to the baseballs with the league logo, but she couldn't actually overcome the shortfalls of whomever their purchasing agent is. C'mon guys, pennants and baseballs don't spoil with age. They're just as durable and salable as those foam fingers and miniature bats you had. And you cannot tell me that league logo baseballs sell better than baseballs with your own logo would. What the heck am I supposed to put in my "these are the teams I saw this year" baseball case? A mushy ball? C'mon. Anyway, now that I've finished my min-rant, the game itself was fun to watch and the crowd was live. Because the stadium was a classic metal one, they were stomping like madmen and the noise was intense. And, unlike most American crowds which stop once the batter settles in, they kept going, cheering, jeering, and stomping while opposing players were at bat or pitching. I loved it and wish more American crowds were as in to it as this. 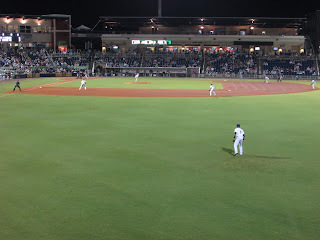 As for the game itself, in the third inning an error by (prospect) SS Lucius Fox, a passed ball, and a wild pitch put a Greensboro Grasshopper on third so that a simple ground out allowed him to score. 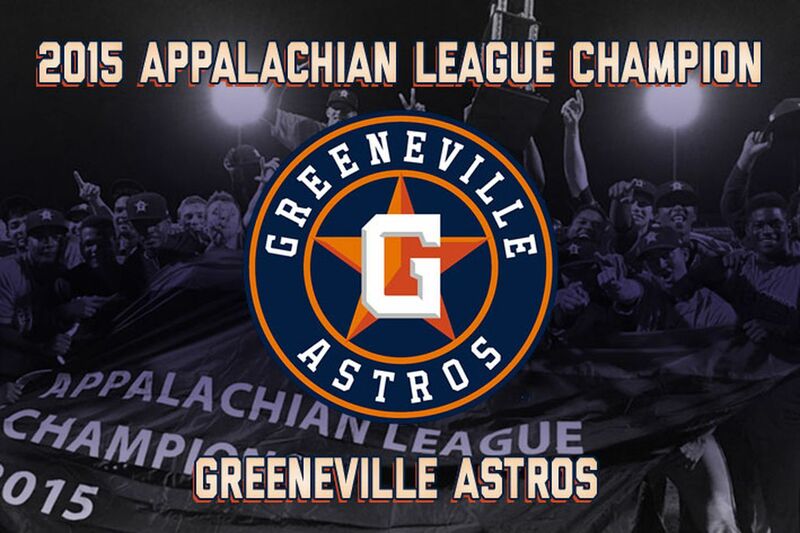 In the 4th inning the Grasshoppers got another run across the plate with a bunch of singles and the GreenJackets answered with a bunch of singles and a ground rule double to score four of their own. Unfortunately, after the 4th the Grasshoppers took solid control of the game. In the 5th, the Grasshoppers got two runs on an error and then in the 6th the Grasshoppers used a bunch of singles to get two more runs across the plate. Final score GreenJackets 4 - Grasshoppers 6. All-in-all, a very pleasant experience with a live, loyal crowd at a fun stadium. It's an experience worth having and I'd advise you to go now before it gets moved to just another generic, interchangeable minor league park. To be fair, the City of Richmond had been jerking the AAA Braves around for years and it became obvious that they were not going to get the new, state of the art stadium they wanted out of the city. I'm not sure if the Richmond mayor and city council didn't care or were just incompetent (or possibly worse) although I'd lean toward the latter. 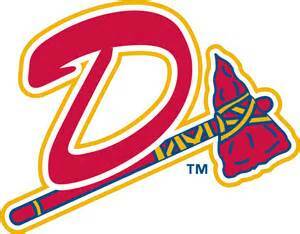 In any event, after years of threatening to leave the AAA Braves finally pulled the trigger. 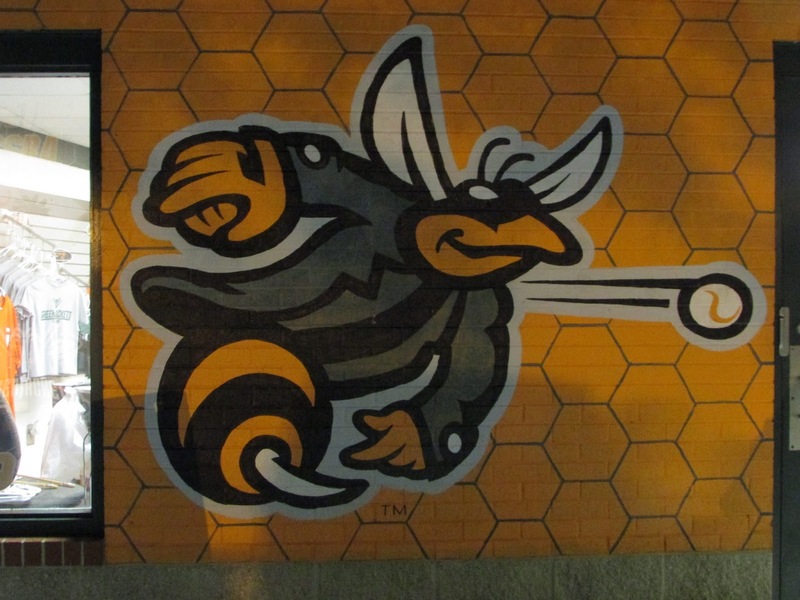 Richmond replaced the AAA Braves with the less prestigious AA Flying Squirrels (in the same stadium) and moved on. 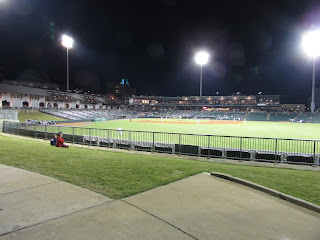 In the last several years the Richmond Flying Squirrels have had excellent attendance and several times had the highest year-long attendance in AA. 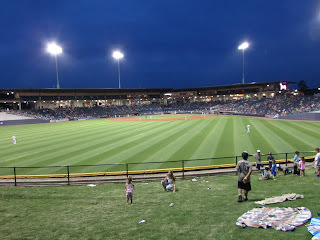 On the other hand, the team that moved to Gwinnett County, Georgia fell flat on its face with fewer people coming out to the park year after year. 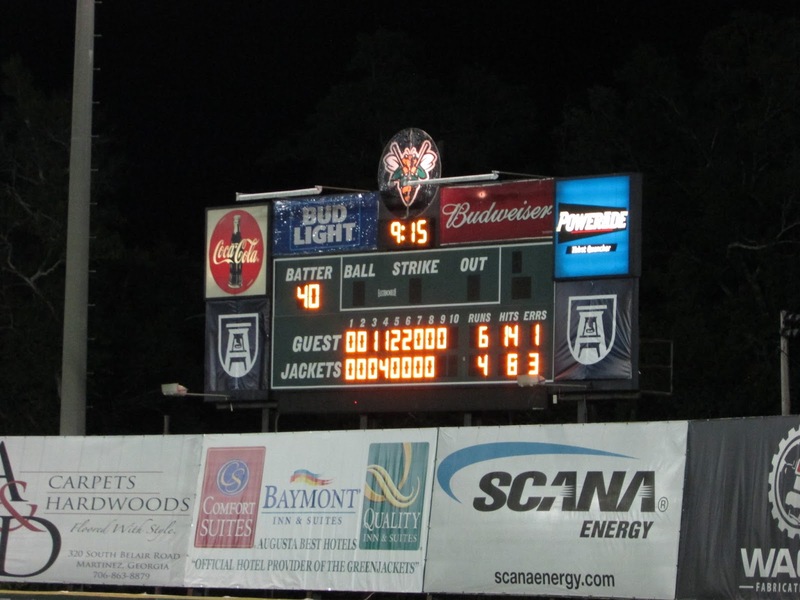 In fact, last year the AA Squirrels had 472,828 fans attend their games while the AAA Braves only had 270,336. That's pretty much the definition of failure. With all that in mind, when I went to the Gwinnett County I wasn't sure what I was going to find. What I found was a generic, but solid AA stadium. You read that right, a generic, but solid AA stadium. 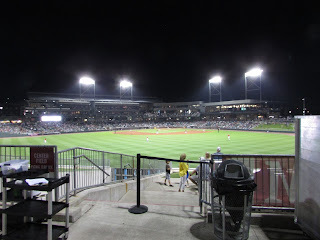 The night before I had been at a AA stadium which was really more of a AAA venue in Birmingham. 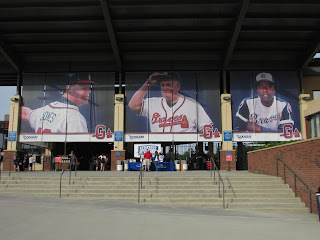 I'm not sure that Gwinnett was really even a AA venue. It had a third of the box seats that Birmingham did and only one or two of them even had anyone in them. And, this was a Friday night - prime time for filling a baseball stadium. It might be a AA stadium in a single-A venue. An unusual, but not unique, part of the stadium was the apartment complex built behind the right field. Several apartments faced the field and some of the closer ones even looked like they had a pretty good view of the park. The apartment complex also had a pool area where residents could sit around and watch the game, although I suspect they would have some trouble seeing what was going on in the deep outfield. The pool itself constantly overflowed toward the ball field making a little waterfall which you could see from the field. Perhaps the coolest part of the stadium was actually the entrance. All that said, the people working the park were friendly and helpful and I spent several innings talking with a couple ushers and genuinely had a good time at the park. There's absolutely nothing wrong with the park itself or the people working there. It just isn't drawing crowds. Okay, so I've pointed out the problems and I think that probably obligates me to offer a solution. 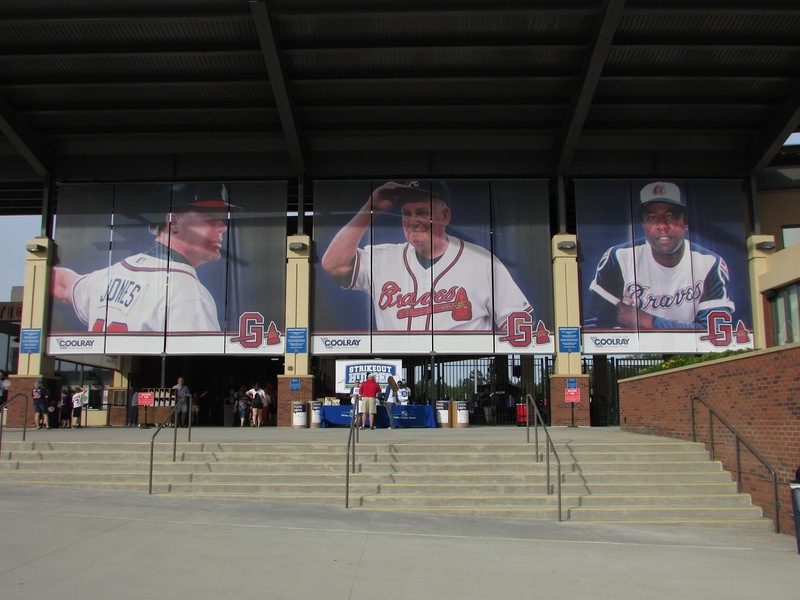 The biggest thing the Gwinnett Braves need is an identity of their own. When you are in Richmond, Virginia carrying the Braves moniker is kinda cool. When you are 45 minutes from the field where the Atlanta Braves play having that name is a drain. 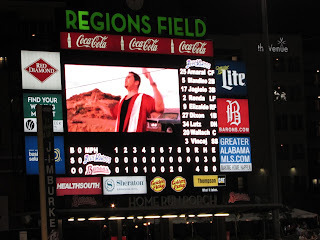 If somebody in Gwinnett wants to watch a Braves game he can get in his car and take a short drive into Atlanta and local billboards which I saw all advertised Atlanta baseball. There's nothing that differentiates the Gwinnett team and attaches it to the community. I've been to 4 minor league affiliates of the Atlanta Braves and the two which have carved out their own identities are doing far better. The Carolina MudCats are just the awesomeness that comes from being the MudCats. The Rome Braves pretty much ignore the "Braves" part of their identity and concentrate on the "Rome" part. 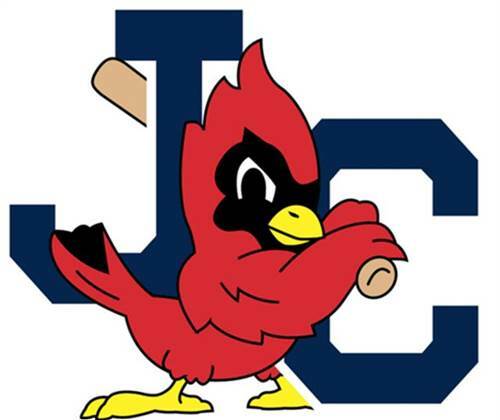 If the Gwinnett club announced a new name to differentiate itself from the major league team right next door, set up a mascot based on that name, and worked it hard then it could provide something for the locals to concentrate on and rally around. 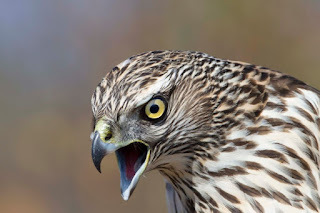 Personally, I'd recommend the Gwinnett Goshawks. 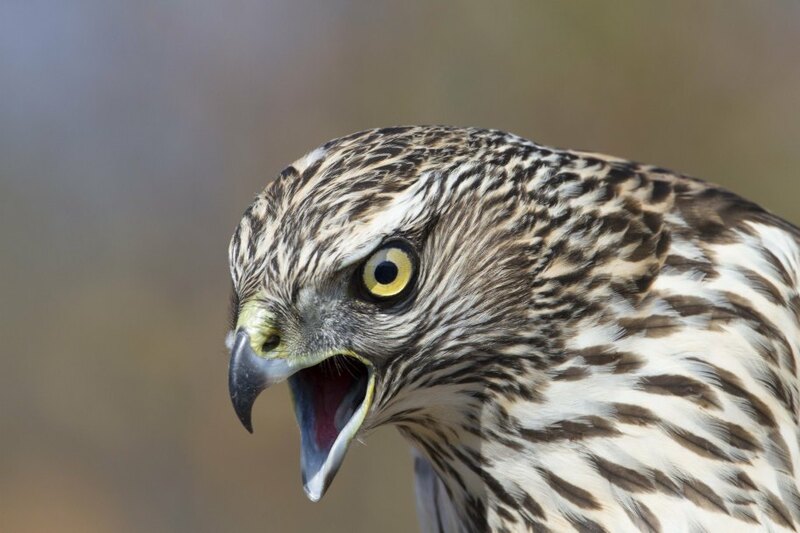 It's a majestic little bird with those bright yellow eyes and could serve well as a mascot. 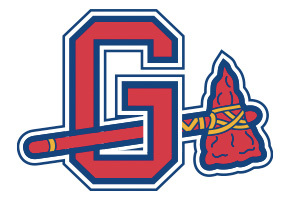 Of course, they'd probably pay some PR firm to make their logo and name and end up being something like the Gwinnett Gesundheits because it would be terrible name and therefore controversial and therefore cause lots of publicity. (bad, short term thinking - I'm looking at you Yard Goats). Other than that, if the Braves organization is determined to keep their AAA affiliate "Braves" then the only real solution would be to move the team to a location far enough away from Atlanta that being "Braves" isn't a detriment. And that would be a truly evil thing to do to the Gwinnett County, Georgia after it put all that money into a ballpark. The Game - And I actually watched a game there too. 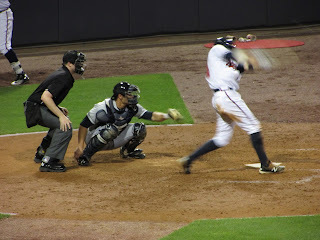 Errors and walks got a run across the plate for the Columbus Clippers in the 2d and the G.Braves got it back in the 6th with two back-to-back doubles. Yet, it was of no avail because the Clippers loaded the bases in the 9th and got three runs across the plate before the G,Braves could shut them down. 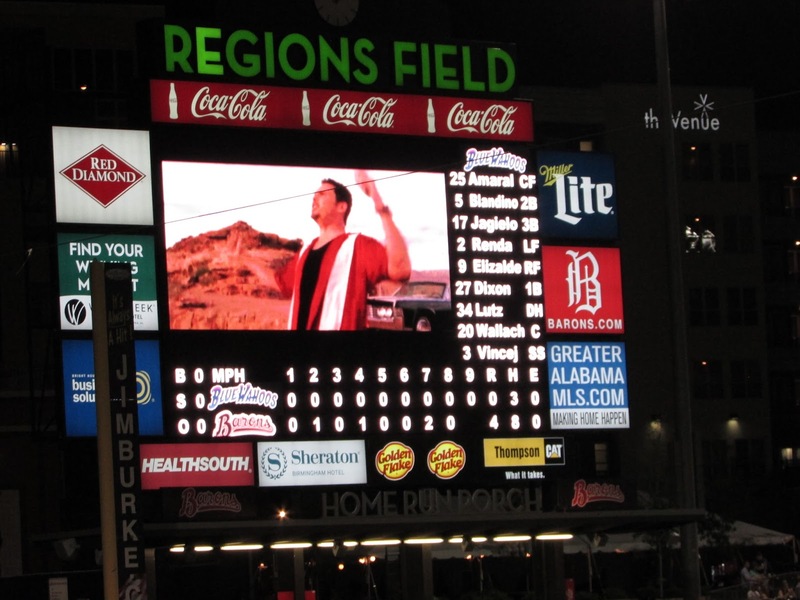 Final score G.Braves 1 - Clippers 4. 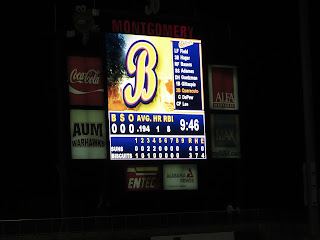 It was a good game in a solid stadium run by good people and the AAA Braves are still obviously failing. In the end, I think the problem can most likely be traced to the fact that the AAA Braves are owned by the Atlanta Braves. 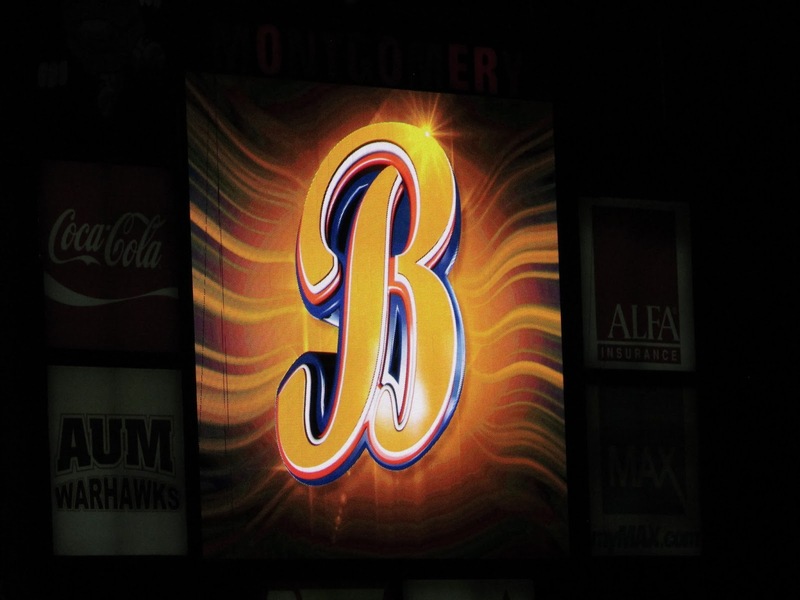 The mothership sees AAA Braves as a stepping stone and not a final thing. 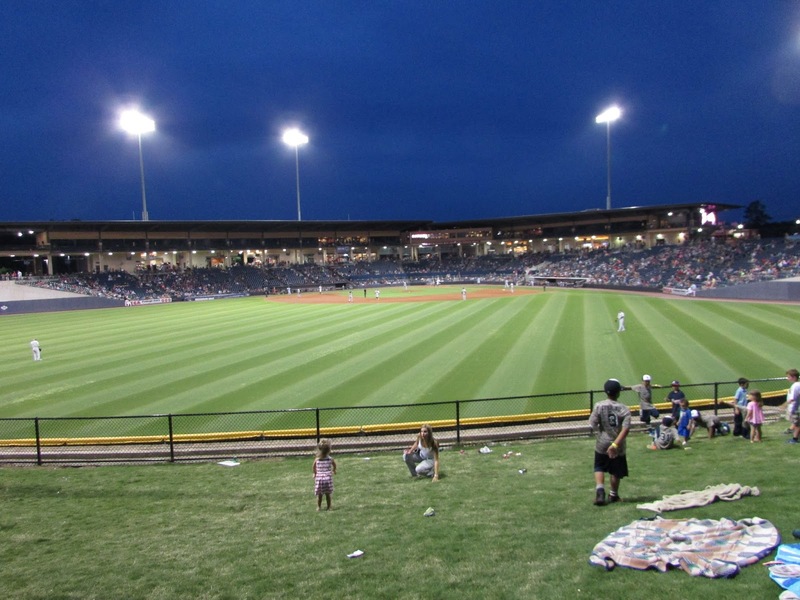 Therefore, unlike a separate owner of a minor league team who has to make the ballpark work in order to earn a living, the Atlanta Braves really only care if there are good facilities for their AAA prospects and other employees. The fact that they aren't developing a hold on the fans in a community which the Atlanta Braves would rather come to Atlanta anyway probably doesn't bother those in the employ of the mothership at all. It needs to be fixed. It won't be. Best AA experience I've ever had. Period. The stadium was packed to the gills although I'm convinced that half of them never saw their seats. A huge portion of the crowd hung out standing behind the right field wall or sitting in the grassy area in center-right. And there were two layers of box seating - all of which were filled. This is a great deviation from the norm at most parks where a few of the boxes are filled, but the rest just sit there sadly dark as an exclamation point for an overbuilt park. The vibe felt a lot like the AAA baseball stadium in Nashville. 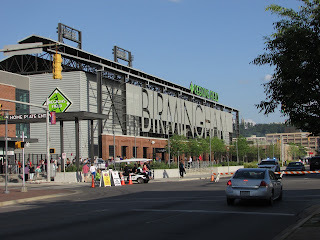 In fact, if the Thursday night crowd I saw was anywhere near typical the Barons really ought to be a AAA team. Maybe they will be if MLB ever does that expansion it keeps saying it needs. The people were friendly, the concourse well laid out and the experience was really, really good. And, they have held onto their history. They're the Birmingham Barons dangit and they're not going to turn into the Birmingham Bacons or Birmingham Blue Crawdads or whatever weird name some ad agency could cook up to purposefully upset people so they can get publicity. It's good to see a team with integrity and the crowds that love them for it. As for the game itself. the Barons easily handled the Pensacola Blue Wahoos. They held the "Yahoo Wahoos", as the announcer kept calling them, to no runs. Meanwhile, homers in the 2nd and 4th got the Barons up and running and in the 7th they loaded the bases and pushed 2 runs across before the Wahoos stopped the damage. 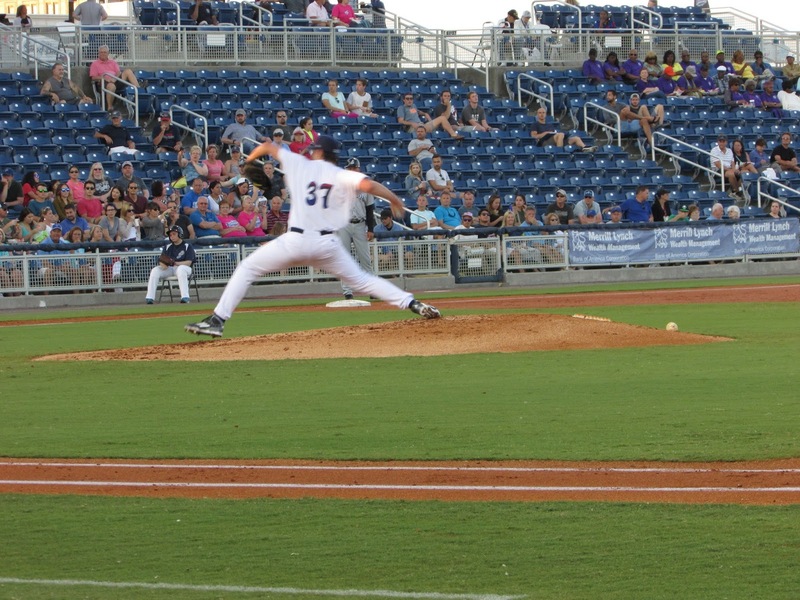 With that, the game ended Barons 4 - Wahoos 0. If you are in Birmingham, go. Heck if you are anywhere near Birmingham, go. It's a great park and a great experience and you need to to be there. 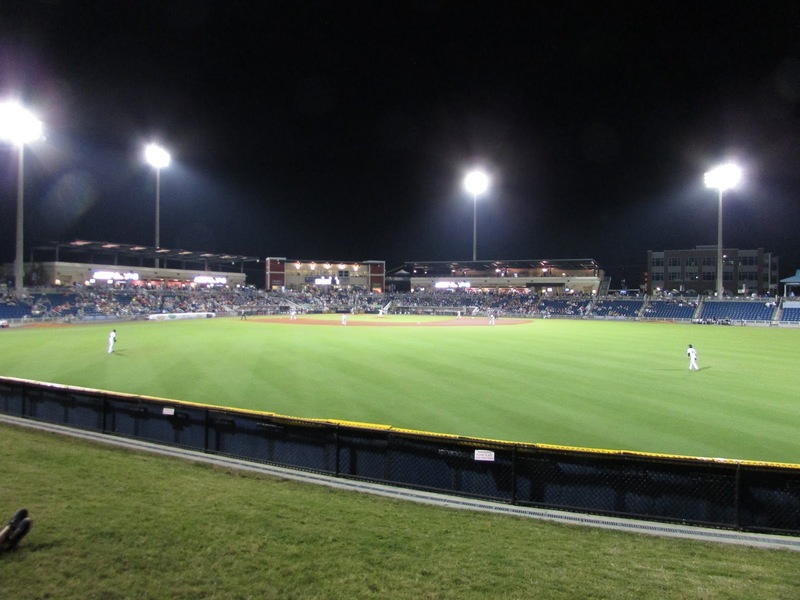 The Blue Wahoos have a nice, shiny new and rather generic AA stadium next to the water. Someone clearly put some thought into which way to face the stadium because when I got there at about 5:30 large roofs were providing shade for almost all the seats - a necessity in a place that's 80+ degrees at time of game in April (who knows what it must be like in August). 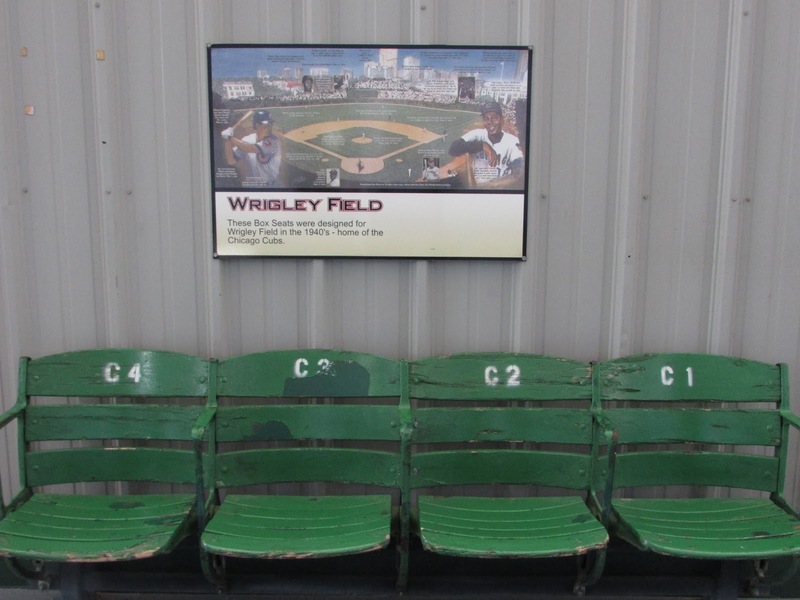 There were surprisingly few luxury boxes which seemed to be limited to the third base side and behind the plate. The rest of the stadium was entirely field level seating. I must admit that I was a little shocked that there wasn't more to the stadium. After all, this is the place where the Mudcats were drug off to to make a better life as the Blue Wahoos and I thought the stadium would actually be better than the one in Zebulon. The best I can really say is that it's newer. The crowd was one of the strangest I've seen in baseball. Few were wearing the Wahoos horrendous logo (see my comments here), although there were a surprising number of people there wearing Cincinnati Reds hats and jerseys. The stands were pretty full for a Tuesday night game but the crowd was eerily quiet. There wasn't even the ambient background chatter that you hear from crowds at most parks. The announcer would play about one thing between innings and not much ever between batters - which was a pretty good call because the crowd just remained silent. After a while it really became noticeable and I started looking for explanations. I thought that maybe it was because the stadium was beside a large body of water which was somehow muting the noise, but as I looked around I noticed that very few people were talking much. They were just sitting there. Weird. The best I can figure is that maybe it's a feedback loop. The water causes an atmosphere where sound is muted and consequently the crowd doesn't make noise. During my trip to the souvenir shop to buy the pennant and baseball I buy at every stadium, a wave of guilt hit me. 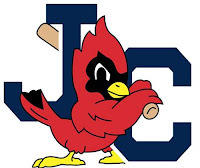 I am at least nominally a Reds fan and this team is a Reds affiliate. Since I was at the stadium, I should buy a hat. Heck, last year I bought a jersey and hat at the Dragons' stadium. Overcome by guilt I walked over to the hat racks, but the just couldn't make myself buy the gawdawfulfugly primary logo hat. I eventually salved my conscience by buying a hat with the hook-P. I can wear that one; people just won't know what it is. 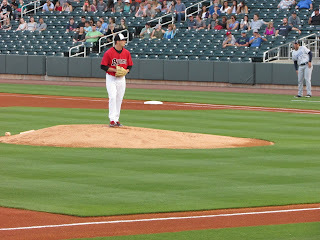 The Game: Homer Bailey is down in the minors recovering from Tommy John surgery and started the game for the Wahoos. And he got rocked. To be fair, 4 of the 5 runs the Jackson Generals scored against him in the first three innings would not have occurred without the 5 errors his infield had in those innings. 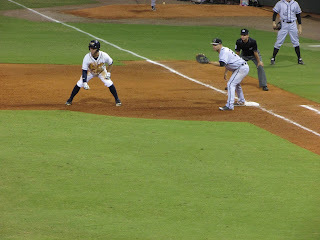 In fact, I think the only infielders without errors that led to runs were Bailey and the third baseman. Well, technically the first baseman didn't have an error; he just dropped a really simple foul ball fly that your basic little leaguer would have caught. Bailey threw fairly hard (once I figured out where the pitch mph was I saw several 94mph's) and showed flashes of really good control. However, AA Jackson's batters weren't having a whole lot of trouble putting wood on the ball - not that this would have mattered much with a little solid fielding behind him. A few better plays and he would have gotten out of his innings having given up only a single run and you could see that Bailey knew it and was frustrated. 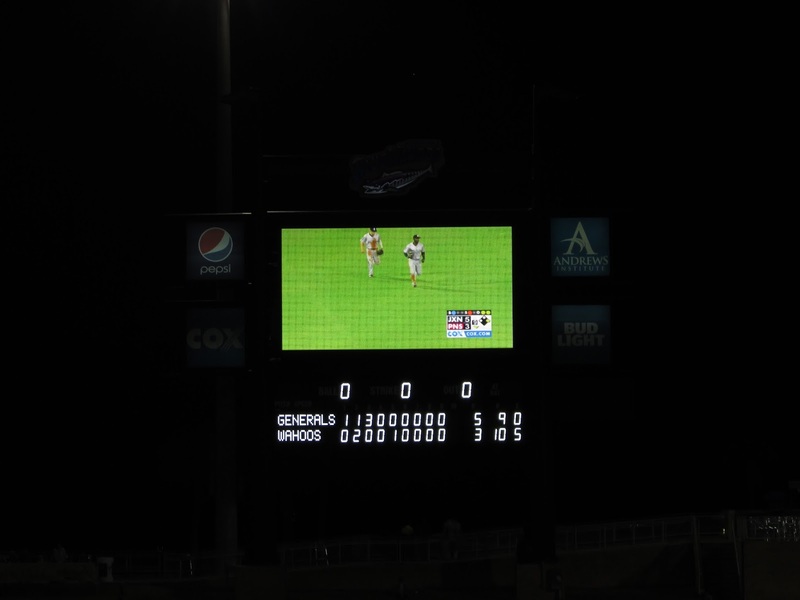 After the third inning the Wahoos settled down and stopped the Generals' scoring machine, but it was too late. 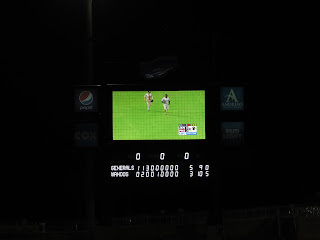 As they rolled into the bottom half of the 9th, the Wahoos trailed 5-3 and the guy running the scoreboard tried to get the crowd fired up by playing some vignette with a fish acting as a secret agent and then flashing psychedelic multi-color fish outlines with the words "RALLY FISH!!!" splashed across them. It was bad and I don't mean cheesy fun bad. That was obviously what they were going for, but it failed miserably and the crowd totally ignored it. The crowd finally did start making some noise, but I think that was in actual reaction to the game situation, not anything anybody up in the booth was doing. 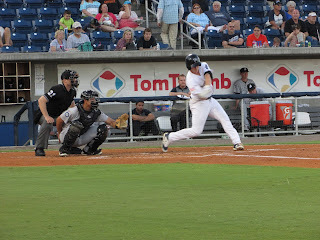 In any event, the best Pensacola could do was get a single off the bat of Calten Daal before the General's closer finished them off. All-in-all, the stadium is nice and there's not really a bad seat in it. Would I go back if I was in the area? Yes. But at least part of that would be because I am a Reds fan. I wish I could get there during a weekend game to see if the crowd engages. 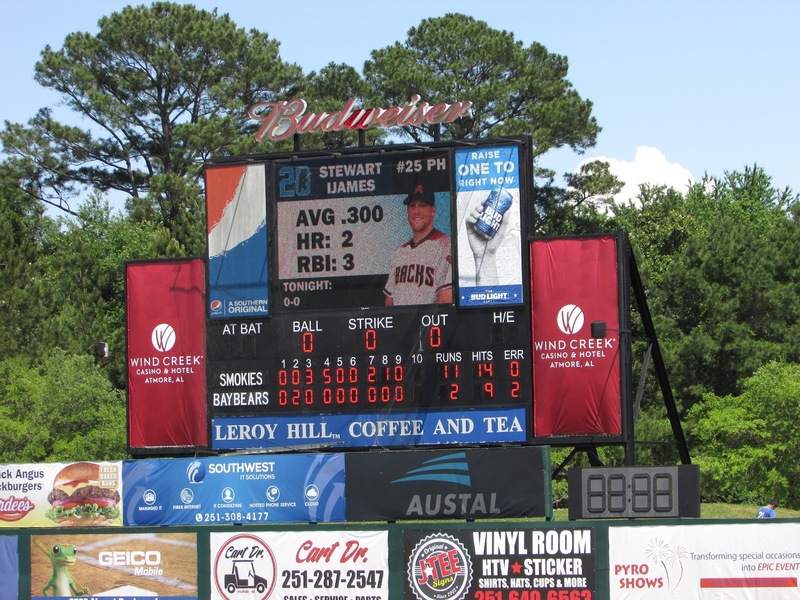 Take a rookie league stadium, put it on the surface of the Sun, add about 95% humidity, and cram a AA team into it and you have the Mobile BayBears during a mid-day game. 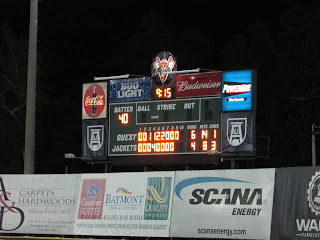 The day I went to Hank Aaron Stadium the game started at 11:05. It was in the mid-80's although intermittent breezes brought occasional relief. In the stadium proper there was no shade unless you were in the very top rows (which were occupied by several high & middle schools on field trips) or you had seating down on the ground level which was reserved boxes with their seats in front of them. This is the worst AA stadium I've seen and it hovers somewhere along the line between single-A and rookie league stadiums. 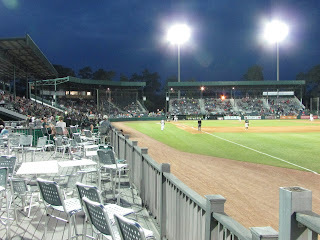 In fact, I've seen a rookie league stadium which is better than this (the Greeneville Astos). In case you cannot tell, I was deeply unimpressed. 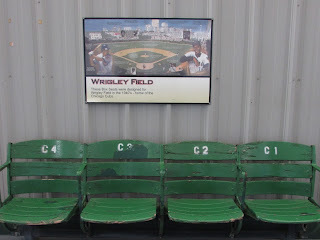 In fact, the only things that impressed me were the name of the stadium and the fact that in the concourse they had old seating from various MLB stadiums including the stadium the Milwaukee Braves played in, the field which preceded Turner Field in Atlanta, and Wrigley (who knows why). 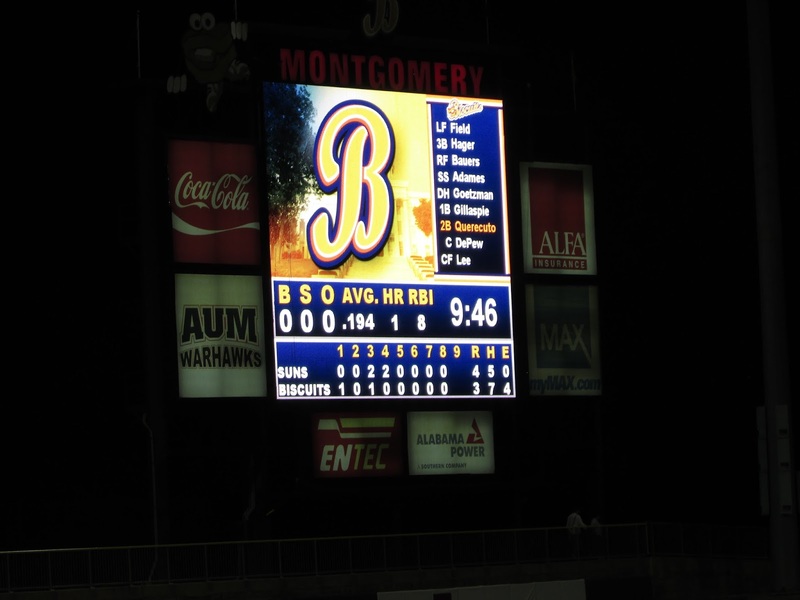 The Game: The BayBears took a brief lead in the 2nd inning with a 2 run homer, but then the Tennessee Smokies took control and just slaughtered them. 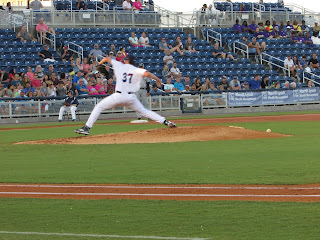 By the end of the game it was 11-2 in favor of the Smokies and both teams limped off the field exhausted. 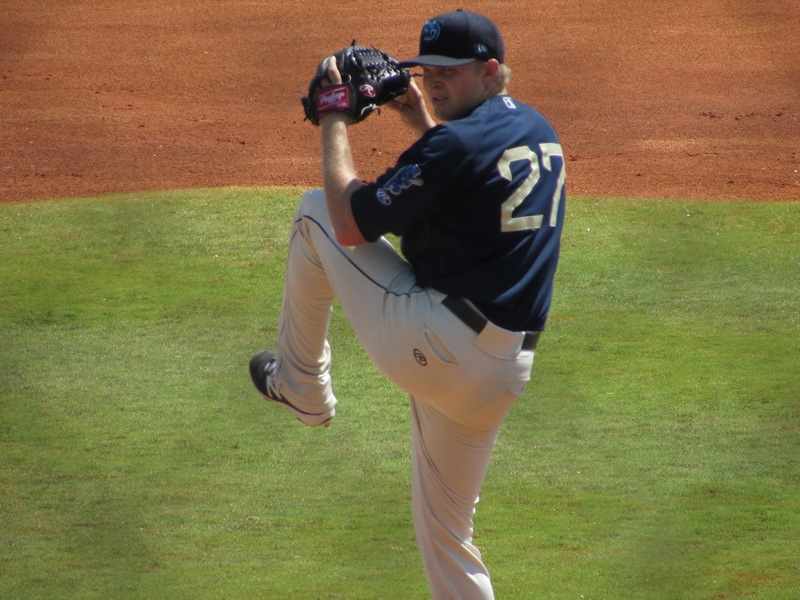 The Smokies at least were wearing the (gawdawfulfugly) light Cubs blue uniform, but the BayBears were wearing dark blue uniforms with dark blue hats. What ever happened to home wears white? 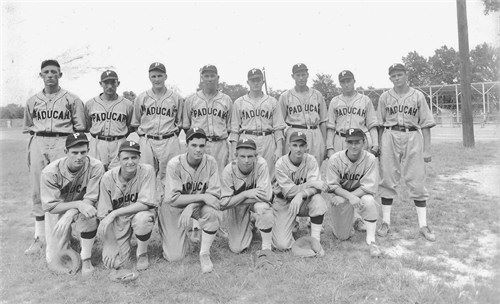 They must not have any light colored uniforms because if you ever wore them you would for a boiling hot and humid mid-day game. I never saw a player from either team not try, but by the 4th inning nobody on that field was moving if they did not have to and every time they had to run you'd see the a player afterward standing there miserable, looking like he was desperately trying to just breathe and stand still for a few seconds so his body could cool enough that he wouldn't fall over. By about the 7th inning, after I'd mostly adjusted to the heat and 95% humidity, I started feeling a bit like a vulture who was watching to see which player would be the first one to keel over. 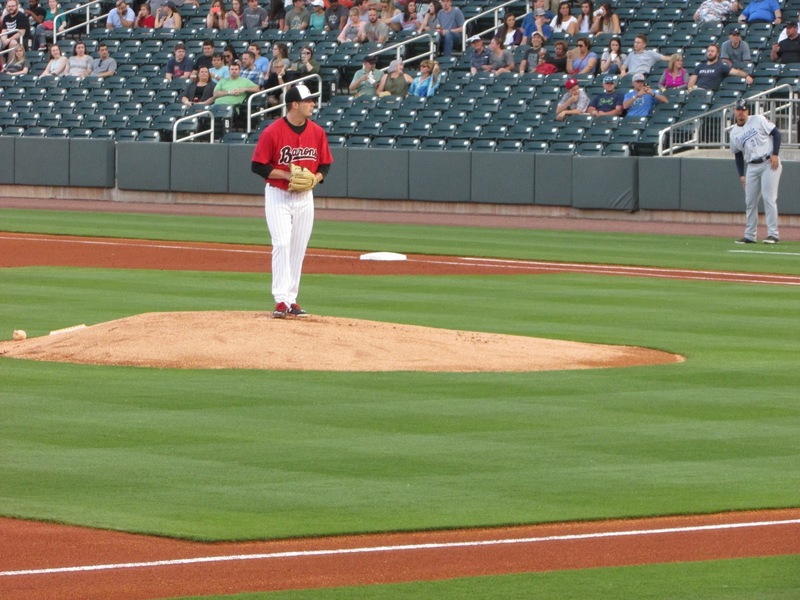 Look, I'm sure that for a nighttime game this stadium is perfectly adequate and there's nothing that a better stadium could do about the heat and humidity of a mid-day game in Mobile. However, there's little good that I can say about my experience here. The staff was friendly enough. Whoever was in the mascot costume was a true champion to stay in that thing through the game. The girls trying to run games between innings gave a great effort although I think they almost gave some little four year old girl heat stroke when they had her race the mascot around the bases. The stadium has a cool name. And that's pretty much all the complimentary stuff I can come up with. Yes, it's a dumb name, The receptionist at my hotel even commented on how much the locals hated it at first and then kind of learned to live with it. And, when you get to the stadium you don't see a whole lot of the locals wearing anything with the biscuit mascot on it. 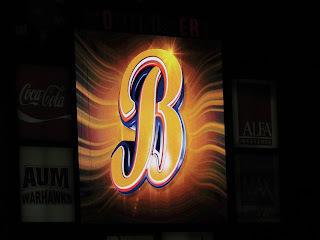 You see a lot of the "B" hats and less often the hats the the "M" and the biscuit peeking over top of it, but I'm not sure I saw any of the hats with the full on biscuit which were prominent at the souvenir store actually being worn by anyone. Personally, I was disappointed that the on the field mascot was some sort of aardvark and not a biscuit. Anyway, the park is very nice. It's a solid AA stadium which had about 40% of the concessions shut down the night I was there, but it was a Monday with a moderate crowd so that was understandable. It looked like when they open it up full throttle this can be a really good park. I like the fact that it I like the fact that it has grass you can sit on in the outfield. The people were all very nice and there was a reasonable variety of different ballpark food - including actual biscuits - much of which was in kiosks around the main entrance. An interesting thing about the field is that there seems to be a railroad switchyard out behind left field. Many times during the night you could hear trains passing, but the only time the track right behind the field was in use was shortly before the game. 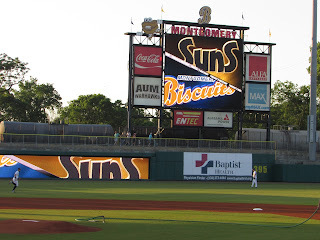 As for the game itself, the Biscuits were playing the Jacksonville Suns and looked pretty good for the first couple innings as they drove a run across in the 1st and 2nd innings with some extra-base hits. 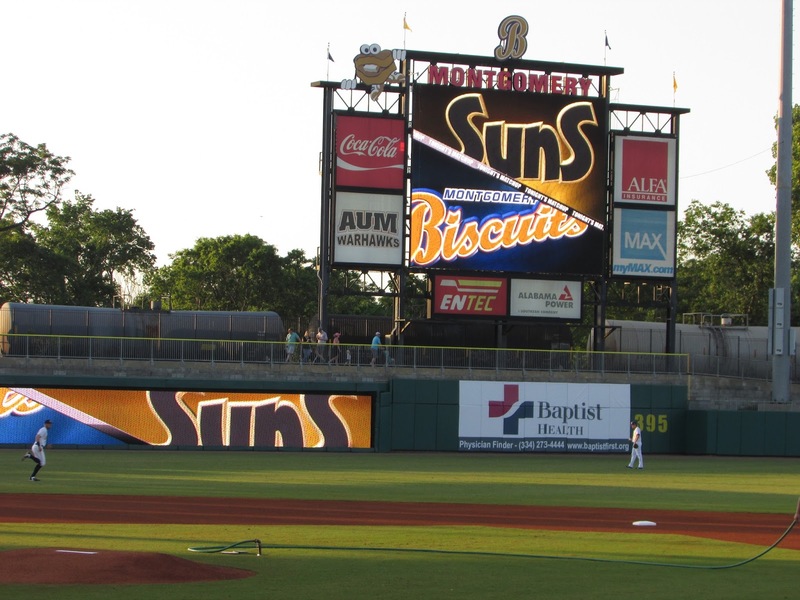 In the 4th, the Suns tied it with a two run homer, but the Biscuits took the lead back with a single run homer of their own. Unfortunately, a fielding error, a triple, and a single put the Suns up for good in the next inning and the rest of the innings were zeroes across the board.